Early Saturday morning on August 11th, I boarded a Greyhound bus to Gatlinburg, Tennessee. I was lucky enough to receive a 50% scholarship from Arrowmont School of Art and Craft to take a week-long workshop in embroidery with Rebecca Ringquist called "Automatic Drawing: From Paper to Cloth." The class description promised a unique approach of combining gestural ways of drawing and embroidering to create layered images. And that we did! I have taken a few sewing classes before, so I know some basics of sewing clothes from patterns and I have always hand-mended my clothes. 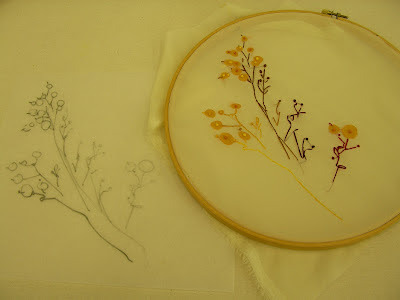 However, I have only dabbled a little in embroidery. Textiles fascinate me, but are a whole new world to dive into. I feel grateful to have had the opportunity to get my feet wet with this class. Set back from the touristy thoroughfares of Gatlinburg, away from the Ripley's Museums and candy shops, Arrowmont is a peaceful and inspiring little world. I felt sad when I had to leave. 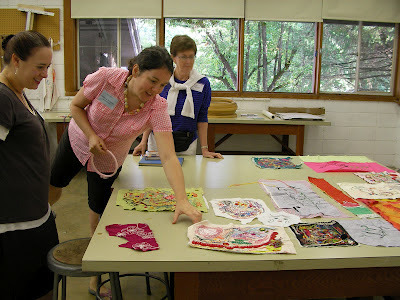 The school is similar to other artist retreats like Penland, Haystack, and Anderson Ranch (to name a few). You pay for room, board, and workshop tuition and spend a week or longer focusing on one medium of artwork taught by a talented artist-instructor. I felt fortunate to receive a scholarship, but there are other options such as applying for Work-Study (ie. tiring kitchen-duty) or being a Teacher's Assistant which help to alleviate costs. I stayed in a dorm-style room which was simple and comfortable. 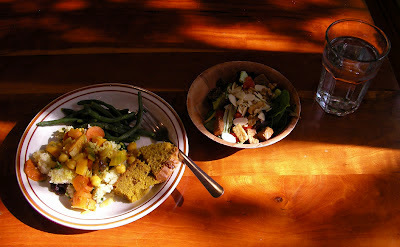 Three times a day, I and other students shuffled down to the Dining Hall to eat yummy, home-cooked meals. The convenience of this routine and not having to cook made it easy to come back to work in the studios. 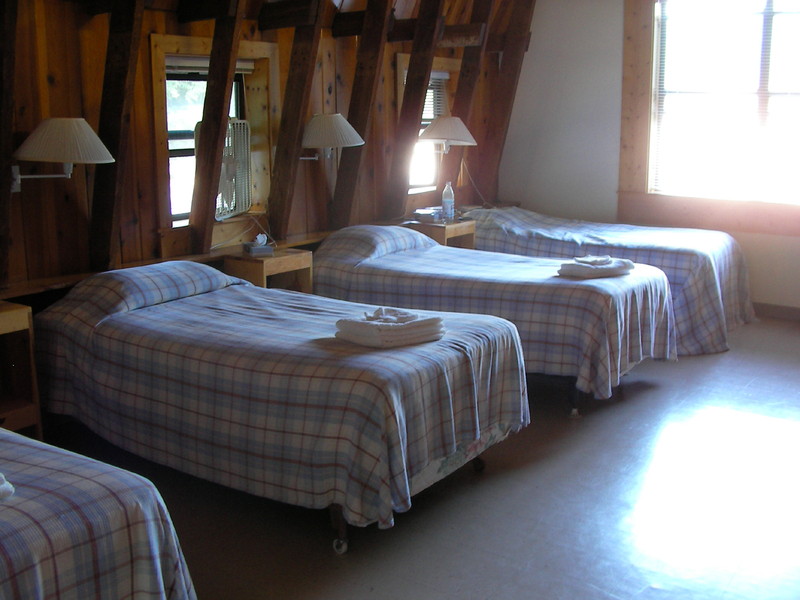 Our classes were from 9 am to 5 pm Monday through Friday, with an hour and a half lunch break in between. 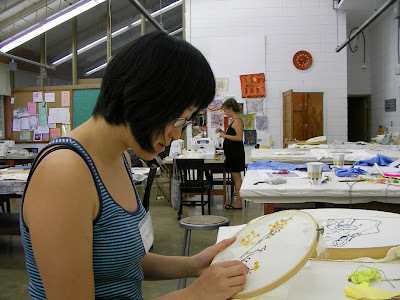 Most students returned to the studios after dinner and sometimes late into the night to continue working. 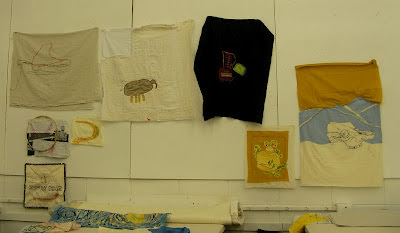 I loved the feeling of having a great studio space and interesting people who were creating things in the same room. It reminded me of my days at Pratt Institute where I was surrounded by other art students. The building our class was held also had a beautiful gallery display of artwork from all the instructors who had taught during the summer. The building also contained a great library and an art supply store. 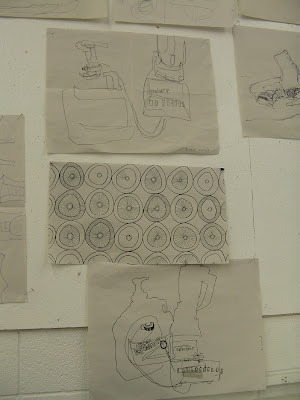 In our class, we created blind contour drawings and patterns. 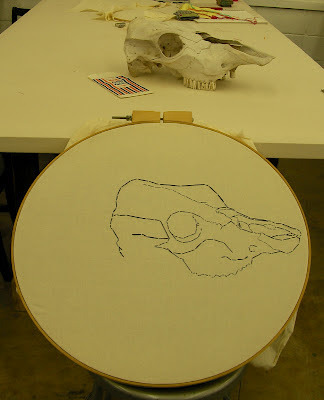 A cow skull embroidered on a big quilting hoop. My work space got rather messy. 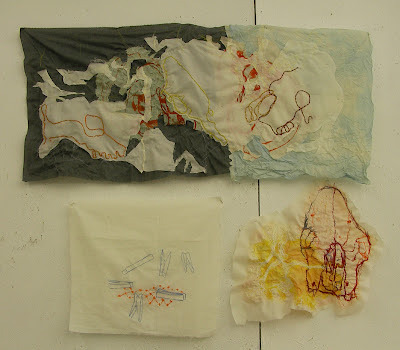 More skull-inspired embroidery by fellow student Hannah. 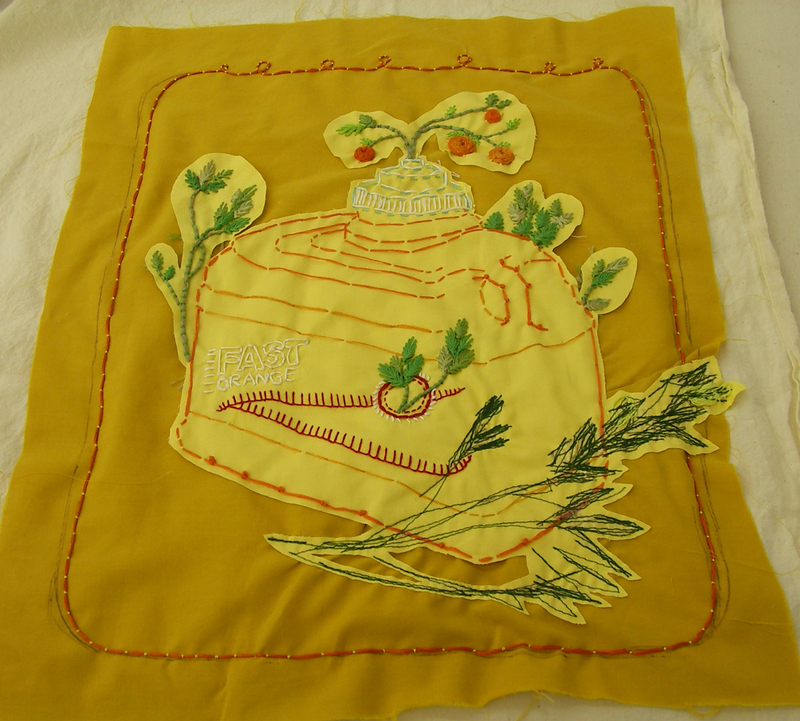 Hand and machine-stitched piece by Victoria. 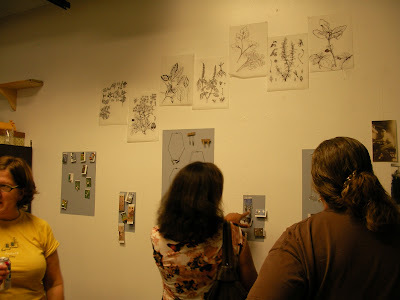 Our work on display for the critique on the last day of class. You can see the evolution of my skull piece on the right. 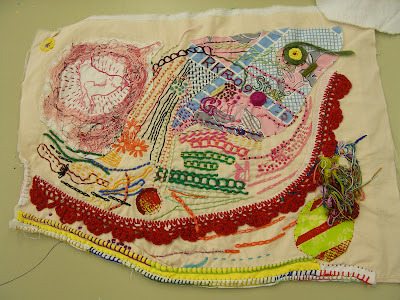 I plan to layer and add a lot to this piece, but I don't expect it will be finished for many months! 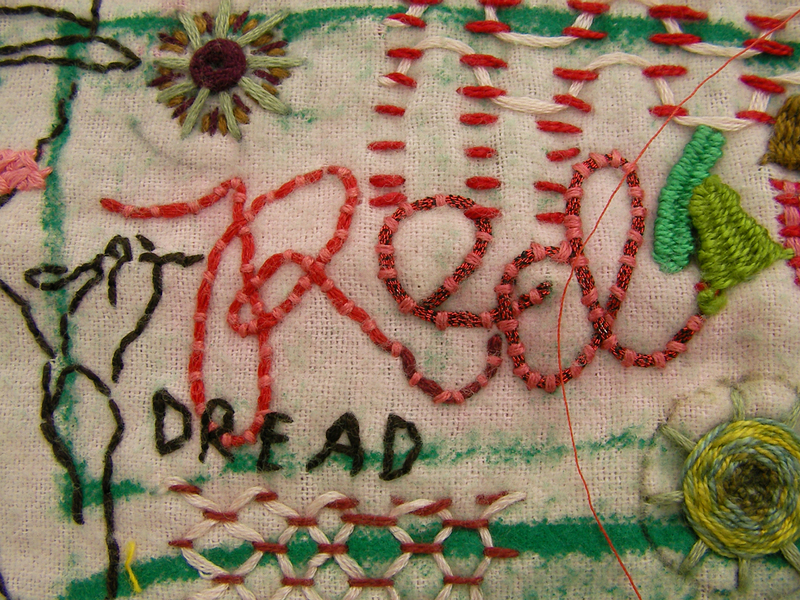 Sadly, I do not have the same amount of time and focus to work on my embroidery right now, but I plan to set aside some regular time to work on it. 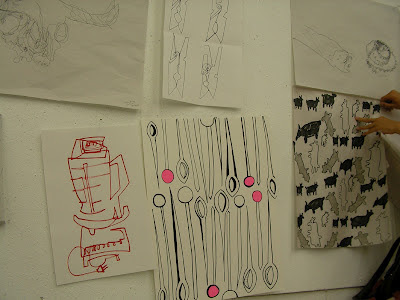 Arrowmont offered other opportunities to get inspired. Every night there were slide lectures from resident artists and instructors. 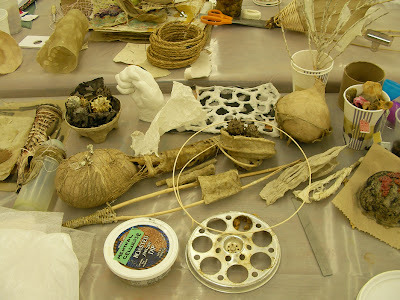 We also had a chance to tour studios and see what other people were making. 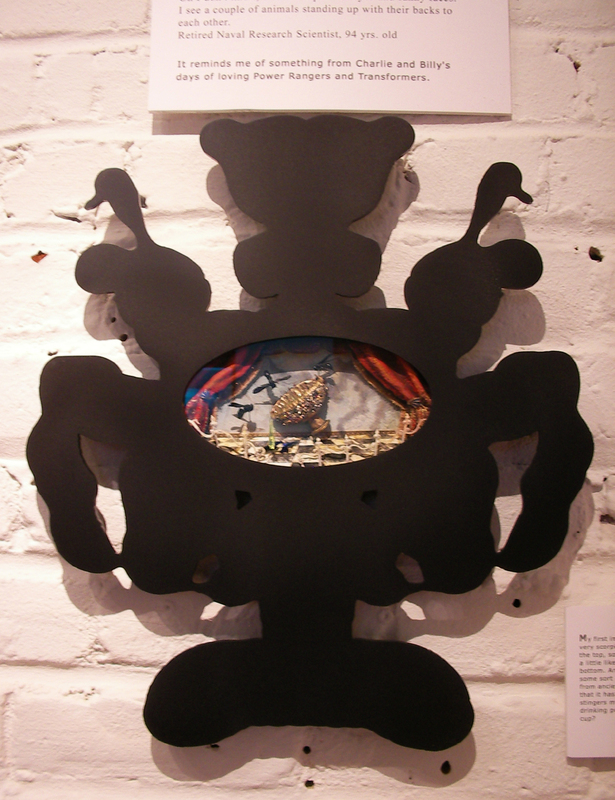 From the studio of resident artist and jeweler Ashley Gilreath. She made beautiful pieces based around the concept of family histories and the importance of honoring genealogy and memory. 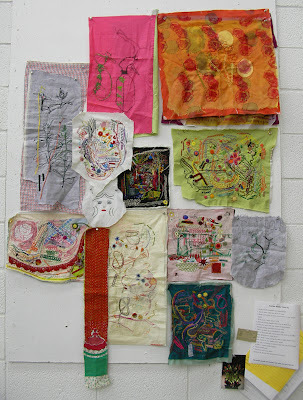 Fascinating experiments in the papermaking studio. I plan to make a zine about my full experience at Arrowmont. For now, I'll sum it up by saying it was eye-opening, inspiring, challenging, and invigorating. 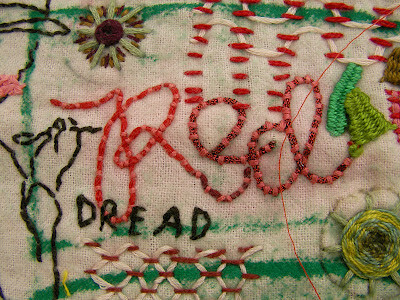 I am now in love with textile art and I can't wait to explore all that it has to offer. 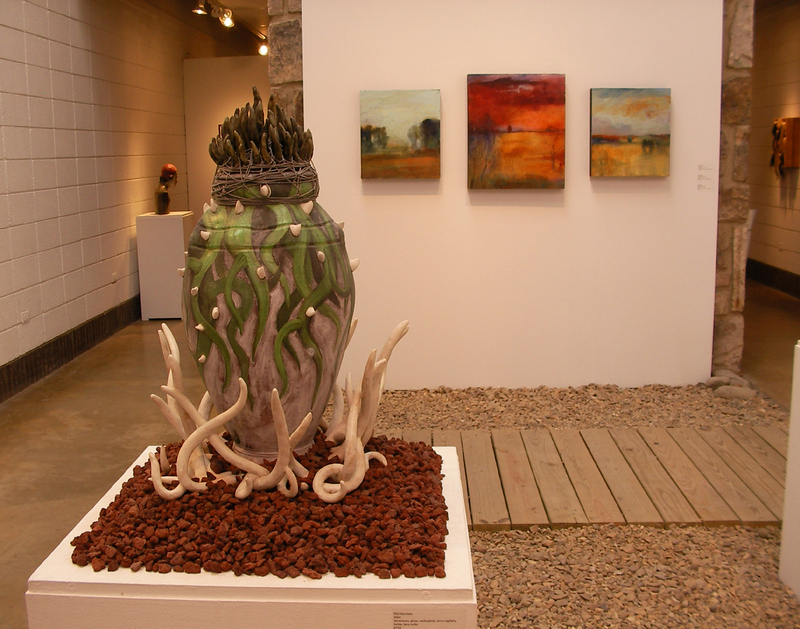 Arrowmont was a refuge of creativity that was invaluable for my growth as an artist. If you are an artist, I highly recommend an experience like this to get away, make art, and be part of an energetic creative community. I am already excited for next year. I don't know where I'll go or what class I'll take, but I know I have to include this as a regular part of my life and artist's practice! This has been one of my busiest summers yet. Here is a recap of how I spent my time from spring through the end of August. Thinking this would be a "test," I used paper that I had previously painted on which you can see a bit in the right side of the paper during the early stages. I really enjoyed the process of creating this painting. However, there are a few things I learned from it. One: I need to map out my composition better before painting! I left out his ear and didn't fix it because I didn't want to have to re-do my drawing. Also, I rather liked the looser, low-key (not as much contrast) version right before the final version. Next time, I'd like to build my painting so it incorporates more of the looseness and color blossoming. But overall I'm happy with it. I created this small watercolor for a friend's baby shower. 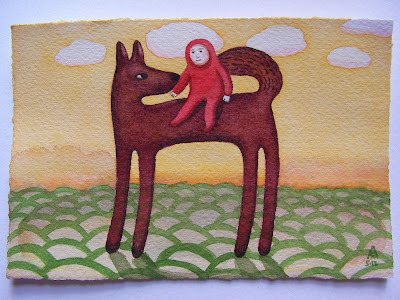 I think of the dog as a guardian, protecting the little one on his long and adventurous travels. 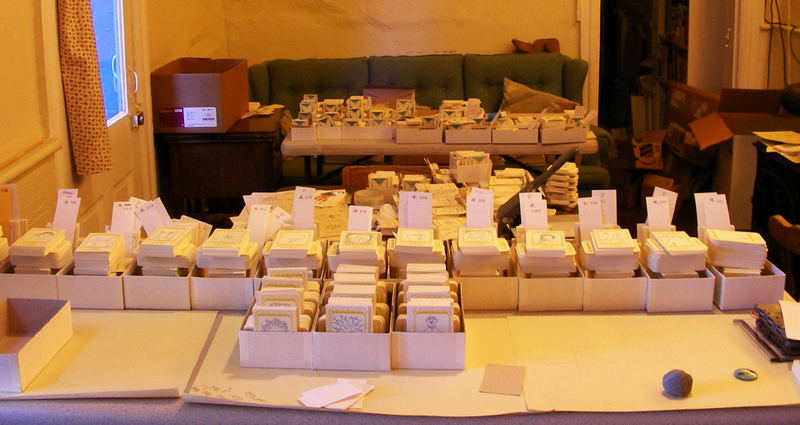 It was physically and psychologically draining to have hundreds of unfinished cards in view for months on end. I have since put them away in a big box and only take them out when I need to assemble more. There are still over 100 decks to assemble. 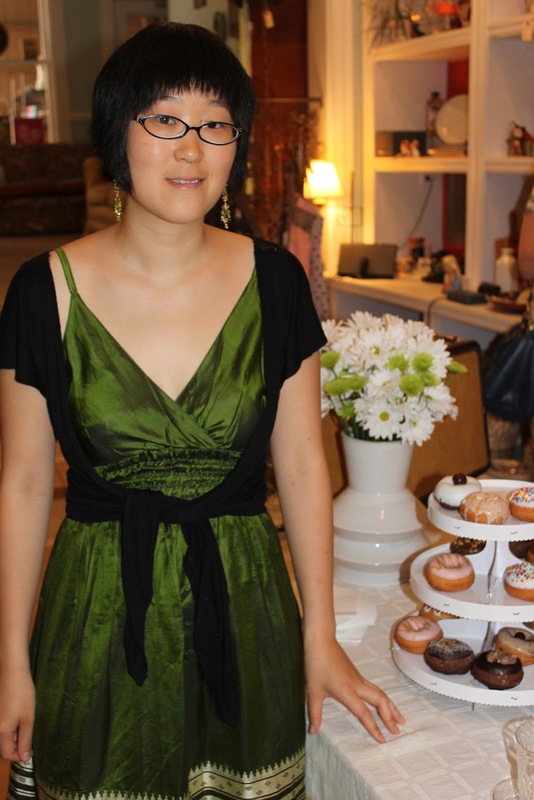 On June 16th, I had a Golden Moth Release Party at the Blue Elephant, a vintage and home decor boutique. 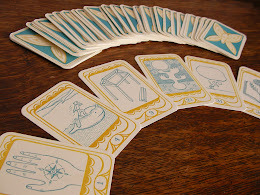 Friends visited, people bought decks and artwork, and I gave several Intuitive Card Readings (similar to tarot readings). Patsy, owner of Blue Elephant, and her daughter Jessica, manager, provided refreshments and a colorful array of tasty donuts. They are awesome people, and so is their store which has relocated to 119 Robinson St between Grove and Floyd Avenues in Richmond, VA. The new space is even bigger and better than the last. It is such a fun experience to sift through all the treasures in their shop. 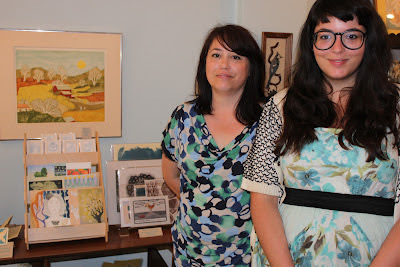 There will be a similar event at their shop coming up on Saturday, September 15th from 1-4 pm. I will be giving readings and selling decks and art. As I mentioned before, I began teaching art workshops to children in June through the end of August. 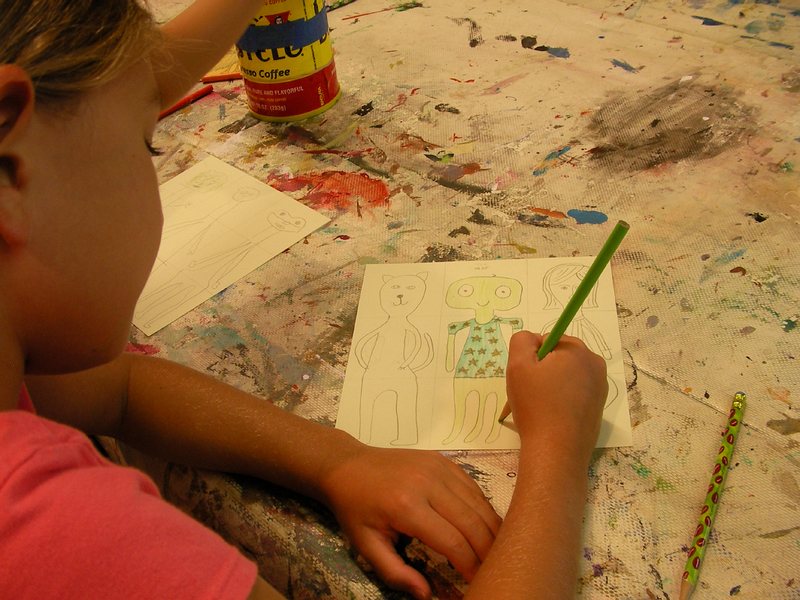 Here are some images from my Paper Toys class for youth ages 6-8. 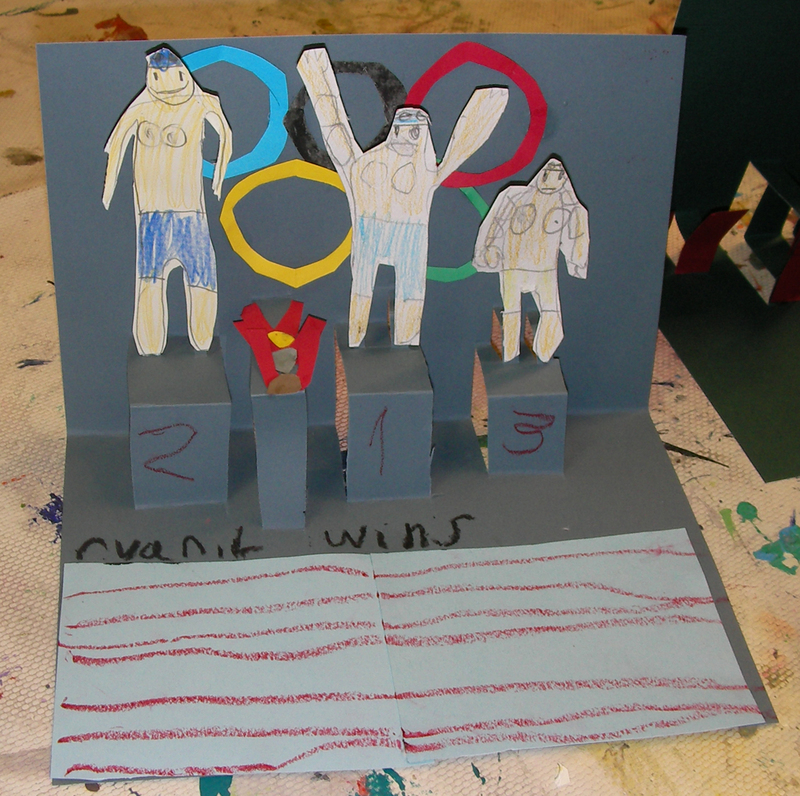 This student spent all class working on his elaborate pop-up card: "Ryan Lochte crushing Michael Phelps." I myself did not follow the Olympics, so it was fun hearing the kids talk about it. 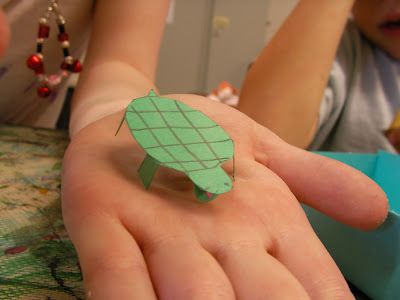 A student came up with this cute paper turtle. Note that the mouth opens to reveal a tiny pink tongue. I also taught a Paper Bead Jewelry Workshop at the VMFA Studio School. 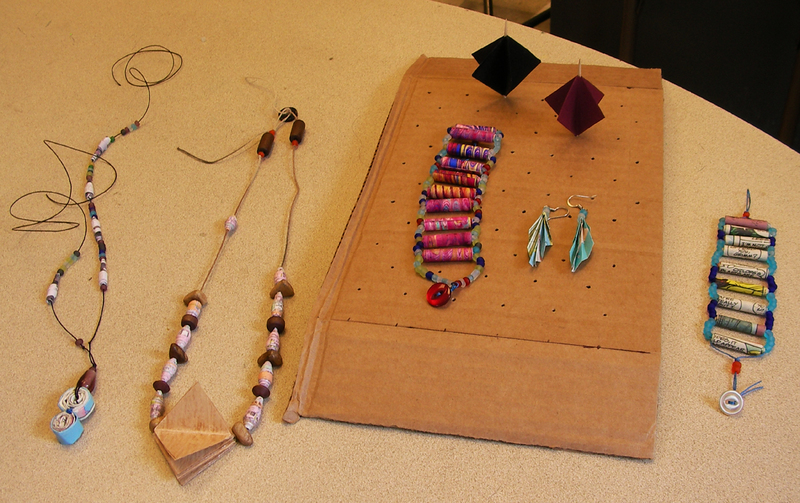 Some cool jewelry made by students in the class. The paper beads were made using recycled magazines, comics, and maps. Most of you probably don't know that my parents have their own Paper Bead Jewelry business. They sell at craft shows and in shops around the country. As the story goes, my mother was inspired by me - when I was a child she saw me creating paper beads for fun. She and my dad took the craft much further and have a multi-step process of selecting papers, painting them, rolling beads quickly using a special drill that my dad created, applying several layers of varnish, and creating jewelry designs. I am proud that I can spread knowledge of this craft through my classes. 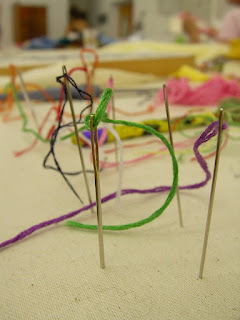 Most of my students find the process of rolling beads to be soothing and even addictive! Here is a picture of a student rolling beads during a spring workshop at The Visual Arts Center of Richmond. In July, I visited my hometown of Rochester, NY. One of the best things about going home is how accommodating my family is. They understood that I was utterly spent from The Golden Moth Project, and they helped me assemble decks and encouraged me to do some heavy relaxing. It was perfect timing to be able to see art exhibitions featuring my sister Olivia Kim and her boyfriend Dario Tazzioli. 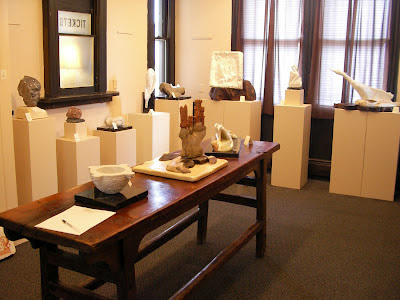 Olivia had some sculptures and painting in a group show at Nazareth College. 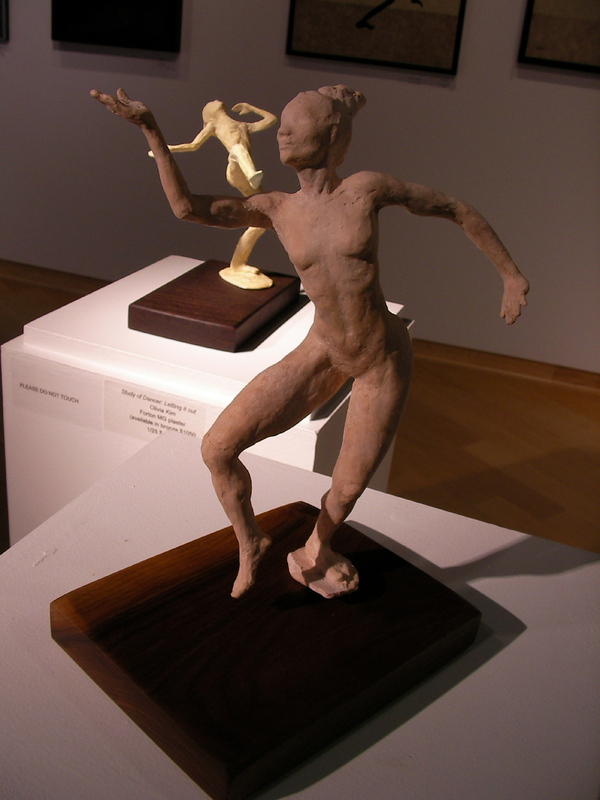 Here is an example of the new direction in her work - a more gestural approach to figural sculptural. Olivia is currently investigating the intricacies of the human body and how it moves. I have trouble enough drawing a moving figure, let alone trying to sculpt it! But Olivia has never taken a challenge lightly. Dario had a solo show, The Inner World of Dario Tazzioli, at Ock Hee's Gallery in Honeoye Falls, NY. He is a stone carver, in heart and soul. 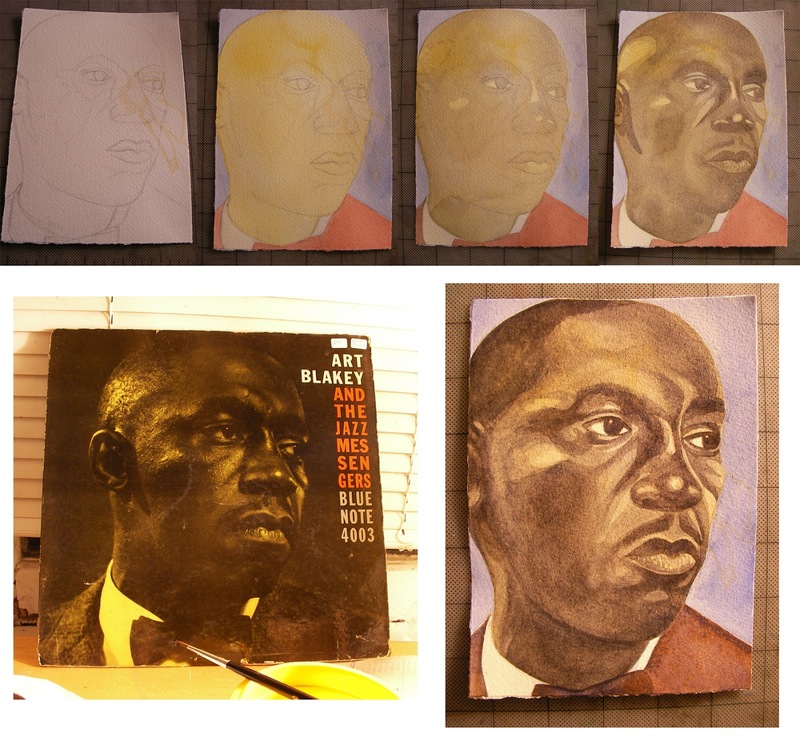 I learned so much by reading descriptions of his process and inspiration for each piece. At the age of 16, he apprenticed with a stone carver who told him that a pyramid was the most challenging form to carve. So of course he went ahead and secretly carved a pyramid. Dario draws inspiration and design from the stone itself - allowing the striking forms, color, and individuality of each piece to reveal itself in the artwork. He also created fresco portraits of people from the small village where he lives in Frassinoro, Italy. 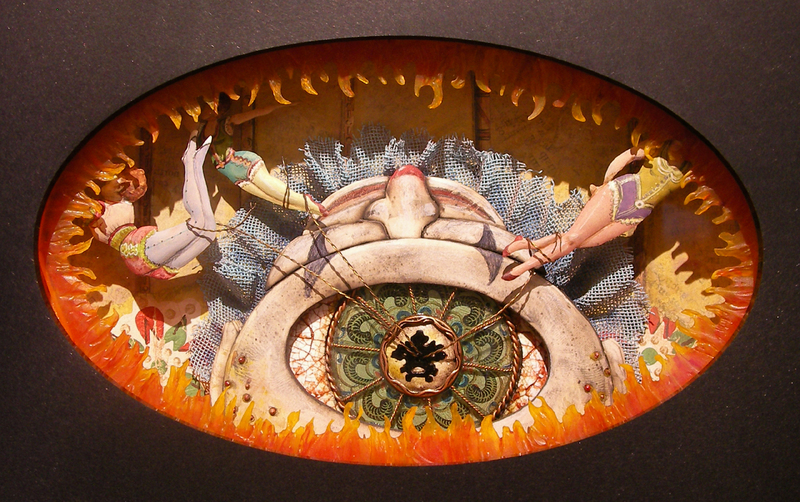 The process of fresco painting is much different than traditional painting. 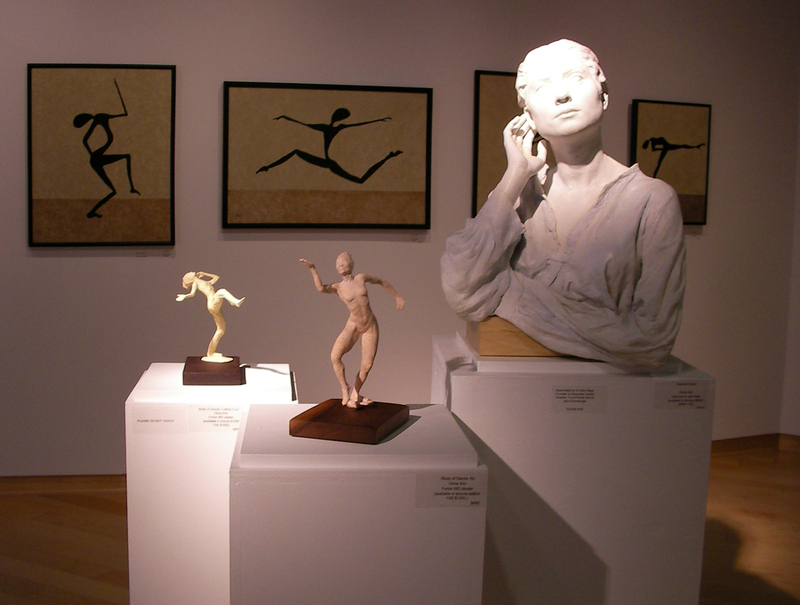 Pigments are mixed into wet plaster, creating an image that is embedded permanently. And here's Greg outside of Ock Hee's Gallery, communing with a stone buddha. On August 2nd, I had the unique opportunity of giving Intuitive Card Readings at the Artist's Reception of two woman who I greatly admire, Robin Kranitzky and Kim Overstreet, at Quirk Gallery. 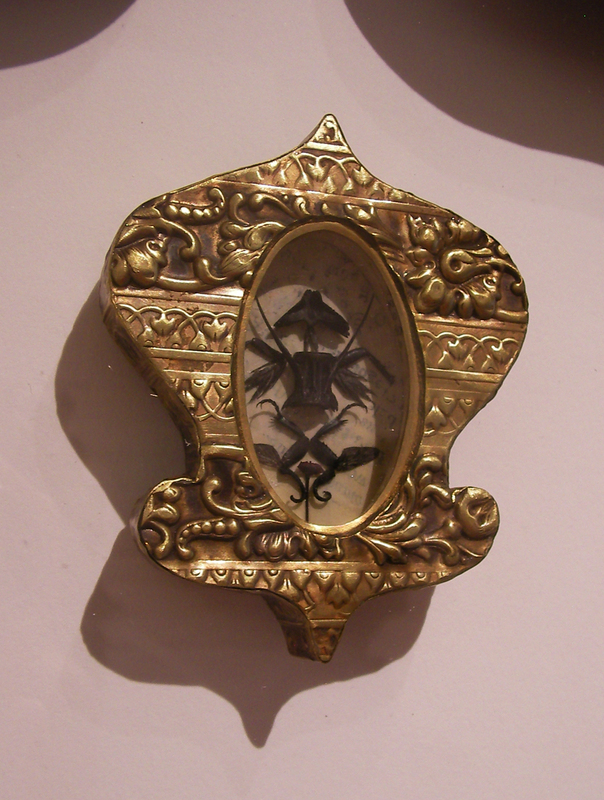 Their elaborately-detailed assemblage jewelry was based on the concept of Rorschach Tests. You can read a great article about Quirk Gallery and their show here. As you can see, their work is just amazing. 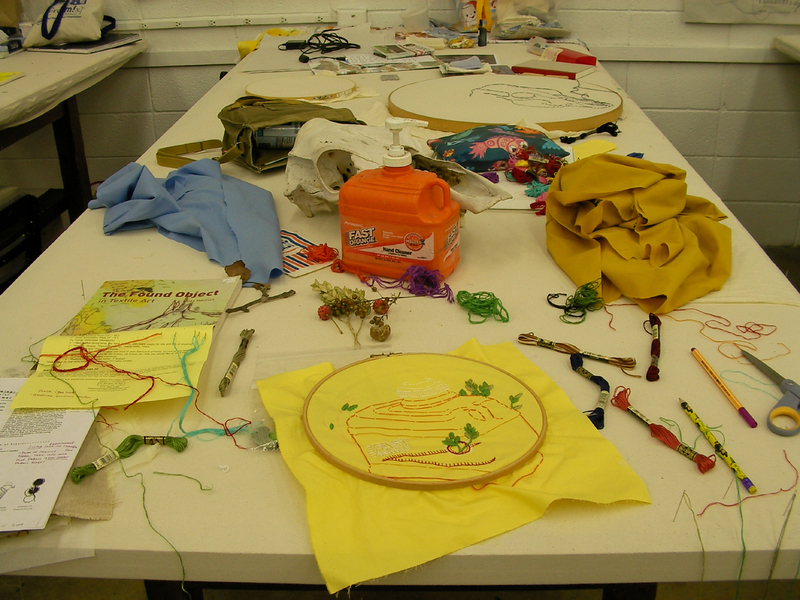 And finally, on August 11th I took a Greyhound bus to Gatlinburg, Tennessee to attend a one-week workshop in Embroidery at Arrowmont School of Art and Craft. I have lots of photos for this one, so I'm going to end this entry now and start a new one about my amazing experience there. Artist, printmaker, zine-maker, illustrator, writer, and aspiring children's book creator. Inspired by nature, comics, and beautiful little things. Subscribe to my E-Newsletter for art-related news and shop announcements! Buy from my shop, Sprouthead! This is a Flickr badge showing public photos and videos from Sprouthead. Make your own badge here. Some Art From the Time In-Between!